FLASHING acceleration — from start to full speed in a few seconds — is a motorcycle thrill that only a “rocket motor” could equal. Just ride a 1932 Harley-Davidson and feel what real pick-up is. See how it shoots you away from tangled traffic. You are down the road, safe and clear, before cars are really rolling. Then the whole countryside is yours — for swift jaunt or long tour. And motorcycling costs so little! 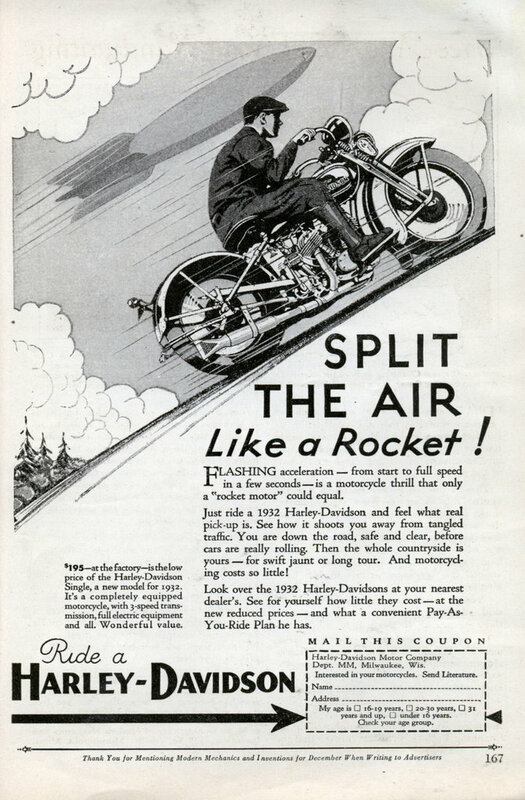 Look over the 1932 Harley-Davidsons at your nearest dealer’s. See for yourself how little they cost — at the new reduced prices — and what a convenient Pay-As-You-Ride Plan he has. More like break the eardrums as so many harleys run with straight pipes. @KH – Harleys generally come stock with mufflers; it isn’t the bike’s fault. Ya gotta love the price though. While looking for acceleration figures (which I never did find), I did find a link showing this 1926 model B (which is apparently just about the same bike but *without* the 3-speed) was $235. Instead of emphasizing acceleration, this earlier ad emphasized getting 80MPG and that it cost 1 cent a mile to drive (versus 8 or 9 cents a mile for a car). With the current economy, I’d LOVE to see an 18% price drop in some items 8-). Christoph: Overtaking slower vehicles in 2-lane roads? At least there’s a “slight” difference in acceleration from let’s say 80-100 km/h between my current cars 133 bhp/ton vs. my very first cars 53 bhp/ton. most bikers I know, the first thing they modify with their new bikes is modify or remove the mufflers.